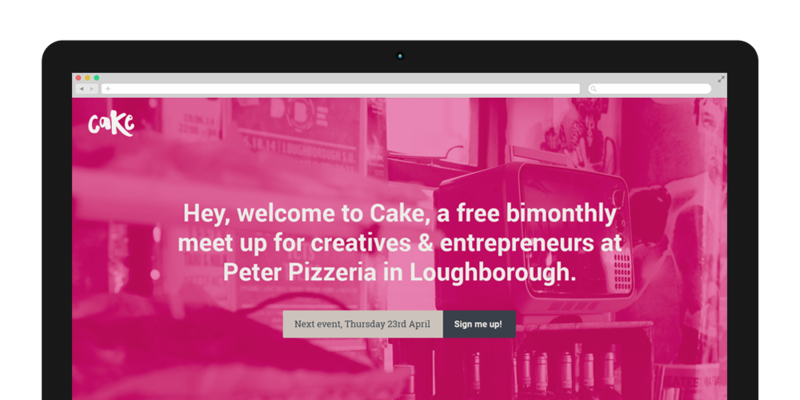 I am really excited to announce the launch of Cake — a free bimonthly meet up for creatives, designers, developers, entrepreneurs and anyone else who fancies a good chin wag and evening of good beer, pizza and inspirational talks in Loughborough. The aim of the event is to build on the already thriving design and entrepreneurial communities in Loughborough by bringing everyone together to make new contacts, learn a few things and share ideas. A sneak peek of the Cake website that is currently being baked. Yes the event will be laced with Cake puns. Kicking off on the 23rd April at Loughborough’s finest Pizzeria, Peter’s the first event will feature 3 great talks from 3 great guys, Liam Doolan, Ed Williams and Nick Bygate. Liam is the co-founder at Comb, a search and discovery fashion app which is currently going through a round of seed funding. It’s a fricking awesome app that has the potential to really shake up the fashion industry, trust me! Don’t act like your not impressed *insert Ron Burgundy voice here*. I am really excited about the prospect of these gents presenting. They have a wealth of knowledge across the board on design, start ups and workflow that could really help anyone attending the event, not least me! For more information on the event please check out the website, cakemeetup.co.uk or follow us on Twitter at @cakemeetup for quick fire news. However if you do have any questions, would like to speak at an event or have an idea for a short talk that you would like to discuss, be sure to drop me an email at [email protected].